Let’s face it, the desolate stretch of highway between Barstow and Las Vegas can really try one’s patience. Not only is it a monotonous route; but outside of the Baker Thermometer, there’s a serious shortage of roadside attractions along the way That said, the Mojave National Preserve (www.nps.gov/moja) offers a welcome respite from the pervasive boredom; as it gives road weary travelers the opportunity to stretch their legs and explore the desert landscape. So, the next time you find yourself nodding off along I-15, hop off the interstate and enjoy this scenic desert detour. Located 60 miles east of Barstow, it’s hard to miss the turnoff for Zzyzx road. The name is certainly memorable, and it always spurs an interesting conversation in our car — “How in the world did they come up with the name?” Although it looks like a jumble of letters, the name was intentionally created by Curtis Howe Springer — a radio host and con man extraordinaire. He named the road — and his Zzyzx Mineral Springs Resort — with the last letters of the alphabet so he could hawk them with the tag line, “the last word in health”. Sadly the resort didn’t have hot springs either — he faked those by using a boiler to heat the pools around the resort. Today Springer is only a memory in Zzyzx. 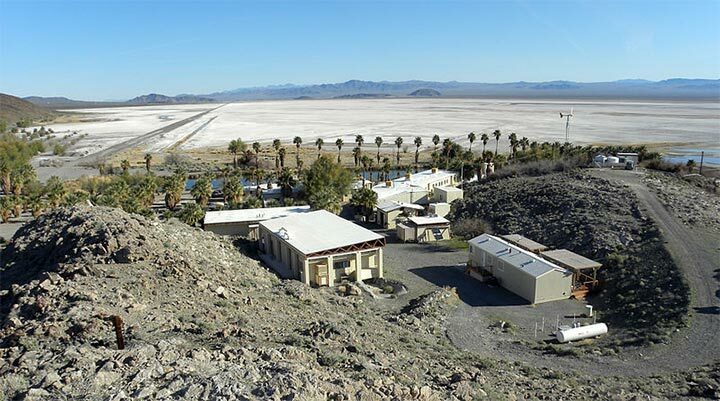 The property is now home to the California State University Desert Studies Center; but visitors are welcome to walk around the property as long as they don’t disturb the students. The five-mile road to the former resort is mostly paved, and it passes by now dry Soda Lake before it dead ends in Zzyzx. There’s accessible parking in a gravel lot near the Orientation Center, and curb-cut access up to the adjacent accessible vault toilets. And that’s pretty much it for creature comforts. There is however, a nice quarter-mile trail around Lake Tuendae, which is located behind the Desert Studies Center. From the parking area, go past the picnic area and take a right on the paved road, then take a left on the hard-packed dirt trail that leads over to the lake. The trail is level, and certainly doable in a wheelchair. It’s an excellent place for desert birding, and there are a number of interpretive signs along the lakeside trail. And if you’d like to stop for lunch here, at least once of the standard picnic tables in the parking lot has room for a wheelchair to squeeze in on the end. Kelso Depot is also worth a stop while you’re in the area. As an added bonus you can cut through part of the Mojave National Preserve after your visit, and dodge the interstate traffic. Kelso Depot is easy to find too — just take Kelebaker Road in Baker, and continue on through the desert for 34 miles until you reach the historic site. You really can’t miss it — it’s the only thing for miles. 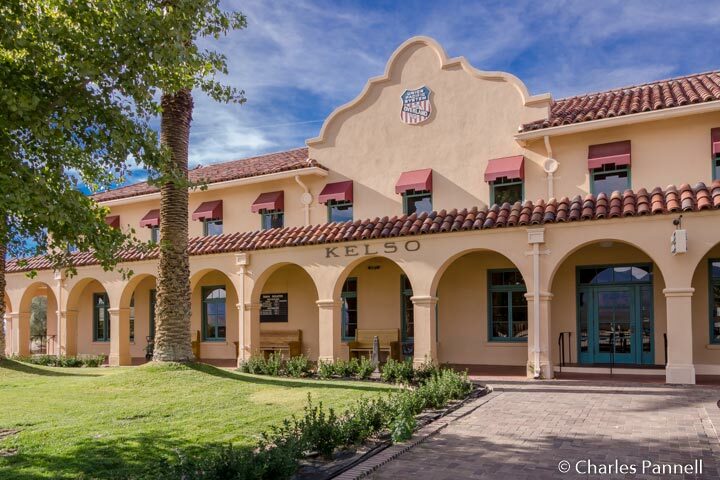 Built in 1924 Kelso Depot also contained sleeping quarters for employees as well as a restaurant. The Los Angeles & Salt Lake Railroad constructed the facility in order to compete with the popular Harvey Houses that the Santa Fe Railroad operated. Kelso Depot was upscale for the time, and it even had a billiard room and a library. The depot ceased functioning in 1962, although the restaurant remained open until 1985. Today it houses the visitor center for the Mojave National Preserve. Accessible parking is located in front of the depot, with level access over to the visitor center and the nearby accessible restrooms. Inside there’s barrier-free access throughout the facility, which includes interpretive exhibits about the Mojave National Preserve. Additionally the baggage room, ticket office and two dormitory rooms are furnished as they would have been in the 1920s. Unfortunately the visitor center is only open from Thursday to Monday, but even if it’s closed you can still get a gander at the lunch counter, vintage desks and old equipment through the large front windows. 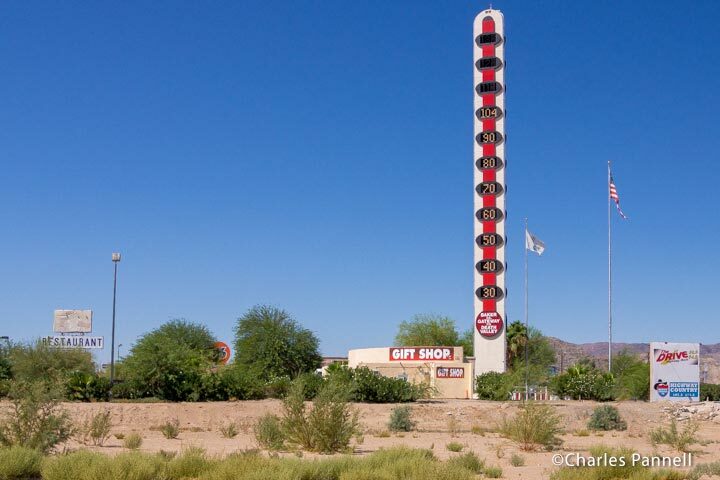 After you’ve had your fill of railroad history, continue on along the Kelso Cima Road to Cima, then follow Cima Road and connect back to the interstate about 22 miles west of Primm. It’s a pleasant and scenic drive through the desert that offers a much-needed break from the highway traffic. After all, you never know what you’ll find on the road less traveled.